Open any news site and chances are you’ll come across at least one story on yet another spectacular social media brand disaster. You know the type of thing, ad agency convinces Big Brand to ask its Facebook followers to post a single word describing their experience of Big Brand. Loyal followers jump at the chance to tear Big Brand to pieces with hundreds of humorous, offensive and disparaging posts. It’s happened to the best of them, from Qantas to Shell, Nestle to Coca Cola. And it’s not just social media marketing campaigns that can go wrong. Increasingly brands are finding themselves in hot water thanks to their own unthinking staff. Let’s take a look at a couple of recent case studies, and see if we can learn how to avoid making the same mistakes. Iconic airline Virgin Atlantic found itself in social media turmoil when some flight crew decided to set up a Facebook group to complain about their work. Intended to be a private discussion between colleagues, the group administrators had failed to set the privacy settings correctly. Soon, their complaints about passenger hygiene, food quality, aircraft safety, and pilot competence was being viewed by more than 4000 people, who joined in with their own observations on the Virgin brand. So popular was the group that a Facebook search on the word virgin brought the group up as the number one item. Virgin bosses learned of the group and fired the cabin crew responsible, all 13 of them. The union became involved and a year long legal battle ensued, costing millions of dollars. In the end, the crew lost their jobs, Virgin lost 13 highly qualified staff, and the brand suffered serious embarrassment and damage. But a situation like this could have been avoided. Implementing a simple social media usage policy, and making sure staff are aware of it, can help minimise the risk of employees accidentally ruining your reputation. Brand heavyweight Coca Cola fizzed with a recent Asia Pacific social media experiment. The company’s APAC Facebook fan page asked fans to “Add a word to the person (comment) above to create a happy little story”. Sadly, more than 780 posts painted anything but a happy little story, with cheeky participants humorously, and sometimes offensively, denigrating the brand. Within hours the experiment was out of control and Coke was forced to delete the thread, after posting an apology. This incident highlights a problem many brands face. Often their social media activity is left in the hands of enthusiastic but inexperienced staff, and there are few if any processes in place to oversee how these employees are interacting with customers. Proper staff training in effective social media engagement, a system of oversight by senior marketing or comms staff, and a pre-approval process can all help minimise the chances of making an embarrassing mistake like this. After years of expensive re-branding to position itself as a healthy fast food alternative, KFC probably could have done without the assistance of some thoughtless kitchen staff. The two young girls decided to take photos of themselves bathing in the giant tubs used to clean cooking utensils. Clad in only their underwear, the girls then Tweeted the pics to their friends. Within days the images had been viewed by millions of people around the world and KFC, whose distinctive uniforms could be seen hanging in the background, was in damage control. The girls were fired and the local outlet was forced to install new tubs, and promote that fact to its customers. Sadly, staff often don’t stop to think about how their actions might achieve a global audience and damage a brand. Basic social media awareness and a commons sense approach can help. Making such a program part of staff induction goes a long way to avoiding this type of crisis. Chocolate giant Nestle learned the hard way what happens when you try to stifle negative commentary about your brand. Having successfully established a Facebook and Twitter presence with more than one million loyal fans and followers, the confectionary manufacturer was left embarrassingly exposed when a PETA campaign targeted their use of sugar cane sourced from endangered rainforests. 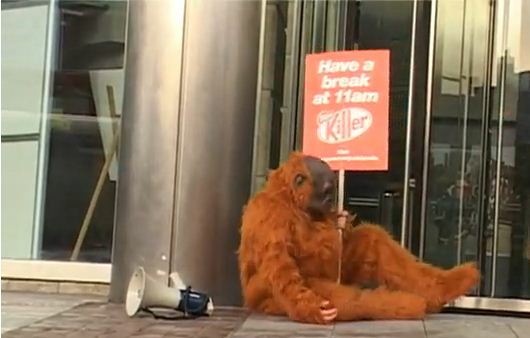 PETA posted an anti-ad on Nestle’s Facebook page, in which a Kit Kat is opened to expose an orangutan’s severed finger. The Nestle employee responsible for the page simply deleted the post, and kept doing so every time PETA reposted. Within days, the site was inundated with posts from angry fans wanting to know why Nestle wasn’t listening to the concerns of its customers, and demanding to know whether the company planned to find alternative sources of sugar. Nestle continued to ignore the campaign for almost a week, during which the conversation became a brand damaging deluge. In the end, the company was forced to acknowledge the issue and apologise for its poor response. But PETA had the last laugh. The campaign had been perfectly timed and Nestle suffered its worst ever chocolate sales for an Easter period. This crisis could have been avoided had Nestle simply acknowledged PETA’s concerns on its Facebook site from the very beginning, with a post saying the company would review alternate sources of sugar cane. Educating staff in how to respond, and more importantly, how to identify issues that should be escalated to senior management, is key to achieving effective social media engagement. Systems, escalation processes, and a little knowledge could have avoided this issue. Make sure staff are aware of it (via training or awareness campaigns), and ensure they acknowledge it so you can take action in the event of a breech. Provide training to those staff authorised to take part in social media commentary on your behalf. Implement internal systems to provide an approvals process, problem escalation process, and oversight process. Make sure a member of senior management has easy oversight of all social media activity (setting up a dashboard to collate your monitoring data, campaign analytics, training results etc is a great way to ensure management has a single view of all your social media activities). Pay attention to what your consumers are saying. Review your social media profiles, campaigns and conversations from time to time to see for yourself what’s being said about your brand. And remember, social media isn’t going away, so there’s no rush to join in. Take the time to get systems and processes in place, provide staff training and develop meaningful campaigns before you leap in. Time and investment spent now will save crisis and damage control later.